British bonding rituals: the weather | Notes from the U.K.
We had a string of sunny, frosty mornings in late November and early December—the kind of morning where we all greet each other by saying either how beautiful or how cold it is. British law mandates that whichever statement you hear, you agree with it. Or if possible, amplify it. When we first moved here, fools that we were, we’d sometimes play the Minnesota macho card. The front of the card is a scene of snow piled up past a car’s roof and the back is a list of wind-chill factors and absolute temperatures in International Falls, Minnesota, which (ignoring Alaska, where it gets colder) calls itself the icebox of the nation. Relevant photo (it does happen sometimes): These flower in the winter. That’s how cold it gets. 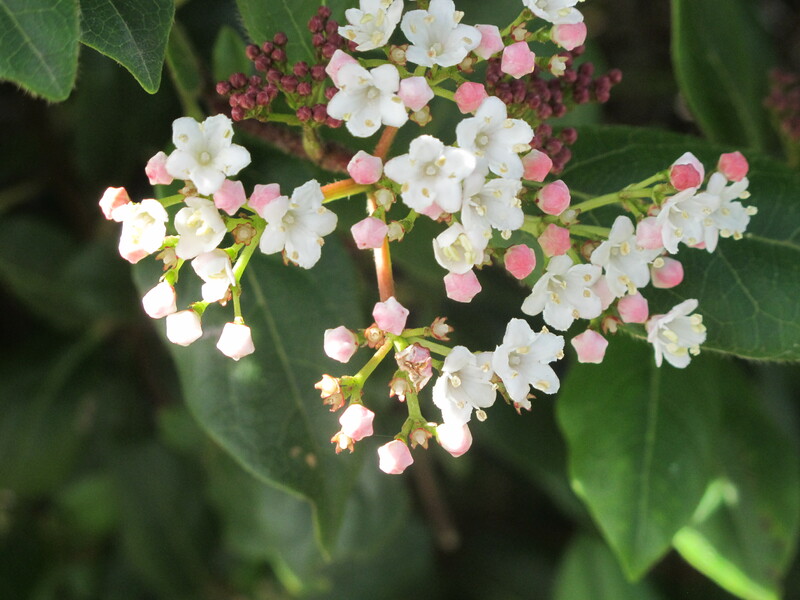 I’m pretty sure they’re viburnum. International Falls is right across the Rainy River from Fort Frances, Ontario, and I’ve never been there. I lived in Minneapolis, which is 294.2 miles away. Pay attention to that .2, because it won’t come up again. Most of those miles run north/south, so weatherwise (and in many other ways) living in Minneapolis is not the same as living in International Falls. According to the great googlemaster, they’re a four hour and thirty-eight minute drive apart. If you don’t stop for coffee and pie. Or a hot beef sandwich. Is anything more American than a hot beef sandwich? But just because I’ve never been in International Falls, is that any reason not to claim its weather as my own? We shared a state. Mi temperature es su temperature, as people who know almost no Spanish occasionally say apropos of not very damn much, leaving me wondering what I’m supposed to say back, although they’re never talking about temperatures, they’re talking about casas. When I explain where I used to live (because no one knows where Minnesota is, even when they think it’s rude to admit it), I usually say it’s in the middle of the U.S., right up on the Canadian border, and as I hear myself talk I think what a liar I am, although what I’m saying is both true and not true. Minnesota is on the Canadian border. Unfortunately, that’s not the same as me being on the Canadian border, although when that wind blew down off the Canadian prairies it felt like I was. From this distance, though, 294 miles doesn’t seem like much. Minneapolis got cold enough to frost my eyelashes if I drove the warm air upwards by covering my nose and mouth with a scarf, which I usually did. (People who object to the niqab, take note, please.) The first time that happened, I had no idea why my lashes were clinging to each other when I blinked, and once I figured it out I was afraid they’d freeze together and I’d never see again. That story’s an example of what Minnesota macho is not. Minnesota macho insists that in temperatures like those there’s no reason to wear a hat. Or gloves. Or to wear a jacket. Minnesota macho says it’s beautiful out, let’s go walk five miles because weather like this makes us who we are. Weather like that did make me who I was: I was a failure as a Minnesotan. In January, I was just a small heap of clothes struggling to get back indoors as fast as I could. The only glimpse of human being you saw under all that cloth was my eyes with their frosted lashes. When we first moved to Cornwall, though, it was hard not to turn ourselves into later-day Paul Bunyans. That last statement is true. It was beautiful, in a horrifying sort of way. It’s a wonder she still talks to us. Eventually we learned: Shut up about Minnesota. People are cold. Hearing that it’s colder in a state they never heard of before they met us won’t make them any warmer. And we were being invited to participate in the essential British bonding ritual, which is complaining about the weather. We should have been thrilled. What could be a more authentically British experience? On Dec. 3, the Guardian wrote about weather alerts and “severe cold weather.” How bad was it expected to get? Why, below freezing. So I’m going to play by the rules here and swear it’s been terrible. In fact, it got so cold the other day that I took my gloves out of my pockets. Then I put them on my hands. All you Minnesotans, stop laughing. This entry was posted in Weather and tagged British bonding rituals, British weather, Cornish weather, Minnesota weather, talking about the weather by Ellen Hawley. Bookmark the permalink. 200 odd years is obviously not long enough for any significant and useful evolutionary changes to Minnesotan biology or physical form. Which is strange because I have this extra 3 inch layer of blubber I have developed here in Cornwall after just a year. Might be an evolutionary urgent scone adaptation. If that’s what it is, I’m all for it. As for me, I did my damnedest to grow fur when I lived in Minnesota and I failed. The lesson I took from that is that evolution is slow, but hey, I’m no scientist so you shouldn’t take my word on it. Growing fur isn’t easy, see ‘my beard’ for a stark illustration. It’s still more than I’ve managed. I believe you. The first time we were in the UK, we spent a week on Skye, and at night we managed to get our chaste little twin beds warmed up only where we were lying. Which meant rolling over came at a high cost. That was in May. Or possibly early June. If you look at a map of the USA, you can see that Minnesota is nicely in the middle of the pole of cold that extends down into the heart of the North American continent in winter. That’s what you get in big continents – no nice nearby oceans to moderate the temperature swings. It’s even worse in Asia of course, A quick google search tells me that the coldest recorded place in the northern hemisphere is Oymyakon in the Sakha Republic of Russia located in the far northwest of Siberia, where “the single school closes only when the temperature drops to 61 degrees F below zero”. Now here in the UK, we’ve got lots of ocean around our island to keep us warm in the winter and cool in the summer – and to supply lots of winter storms, rains and flooding. Oh well, you can’t have it all. For all the weather complaints that I’ve had to agree with since I moved here, I’ll take Britain’s winter any day. I cut a rose to bring inside the other day. Try that in Minnesota in December. Yes, roses often bloom here right up until Christmas (at least they do in the Midlands, South and Southwest). Of course it’s the short days and long nights that visitors from further south often don’t like about winters in the UK. I’ve seen blogs where a lot of Americans (that is, US citizens as opposed to Canadians) find that rather hard to take. But then I suppose most of the USA is a fair bit further south than even Cornwall is. I seem to remember that New York is at about the same latitude as Madrid, and New York is pretty far north within the US as a whole. I personally don’t mind the short days having lived in Great Britain all my life, but then I don’t suffer from SAD. It’s tough for people who do. Minnesota, cold as it is, is further south than Cornwall (she said with great certainty, while wondering if she was actually right about that). And a lot colder. The short days get to me, but not badly–and certainly not when I remember what real cold feels like. You neglected to mention two important matters: International Falls is the inspiration for Frostbite Falls, made famous in Rocky & Bullwinkle. Anyone who wears one of those winter hoods that tie underneath automatically looks like Rocky the Flying Squirrel. I’ll send a picture. BUT, the virtue of living in the middle of the country, far from those warming oceans, is that we will not be the first populations swept to sea as it rises and goes berserk. You wouldn’t know it today but it’s generally getting warmer here so we’ll loll around eating Lutefisk while those of you living near temperate coasts paddle for your lives. Have a lovely holiday Ellen & Love to Wild Thing. Lolling about eating lutefisk? That could make getting swept out to sea look like a better fate. Now that’s what I call cold. “If you don’t stop for coffee and pie” See, this is why I own a GPS. You can’t trust Google for directions if it’s going to make those kind of assumptions. I was just at a meeting in California, where a friend of mine, who lives in Minneapolis, showed us a picture of his daughter coming back from a morning run. Her eyelashes were frosted. The California folks didn’t get it. They were complaining that the daytime highs were only in the low 60s (f). For the record, I live in Connecticut. It was 6f when I woke left for work today. I wore gloves, but no hat, but I was only walking to my car. Ah, Californians. Only 60? They do suffer. Comfortable? It was January. It was Minnesota. We didn’t discuss comfort. The Californians looking at your friend’s photo probably wondered where his daughter got the makeup to turn her eyelashes white. Ha ha – you’re right. That will probably be a product next year. Frosted eyelash makeup. I’d laugh, but you’re probably right. Very nice photos. Thanks for the link. I’m with you on indoor plumbing. And the cold. If I remember right (and the chances of that when it involves numbers–or memory–aren’t all that good), Celsius and Fahrenheit converge somewhere around -30. But by then it’s too cold to care. I do admire your way of reckoning your age. Thanks to climate change, your old neighborhood had roses blooming into November. scary. No way that should be happening. P.S. She was a lot younger than me. But you might’ve guessed that. I had a similar experience while living in AZ. Whenever rain was in the forecast, the media would throw the public into a frenzy by issuing a winter storm alert. This caused everyone to go absolutely bonkers leaving my husband and I exasperated and laughing. It’s just rain people. Where we come from severe winter weather entails snow and bitingly cold winds. Ah, well, frenzy sells. Not to be cynical or anything. I’m from Michigan, not far from Hell. Yes, there’s a Hell, Michigan. And it’s a common practice to go to Hell when the dam freezes so we can take another hilarious picture of Hell freezing over. Then we get hot chocolate at the Damn Site Inn. People who live in extremely cold climes are, in a word, nuts. So that’s damn hot chocolate, then? Minnesota writers were fond of claiming that the state had so many writers because the winters drove us to it. For all I know, it’s true. Whenever I’m feeling sorry for myself about our temperatures I look up Minnesota and tell myself to hush! It has that effect on me too. Mark Twain said, “Heaven for the climate, hell for the company.” So yes, that’s true love: We’ll go to Hell together. Let me know about the paving, will you? Glad to meet you, and thanks for stopping by. I feel all bonded now that we’ve talked about the weather. Actually, I agree. It’s all in what you’re used to (and dampness does make the cold feel colder). But after 40 years in Minnesota, I feel disloyal if I don’t make fun of anyone who says it’s cold when it’s above zero Fahrenheit. I lived in the Twin Cities for years. I practice the same Keep-Mouth-Shuttedness about traffic. Here in rural Iowa, people call a line of 3 cars at a stop sign a traffic jam. We tend to do the same thing in the village. Of course, if you toss in a flock of sheep or a herd of cows, you really do get a traffic jam. To calm myself against the gentle ravages of the British winter, I snuggle under my winter duvet and listen to the Shipping Forecast on radio 4. Poetry…wild and oceanic names like Viking and Cromarty….from the haven of my own bed ! So few people know where Minnesota is that I’ve developed a handy explanation: You take the map of the U.S. and fold it in half from top to bottom. Then you unfold it and look on the crease, right up on the Canadian border. That’s Minnesota. Confession: I haven’t actually tried that, so I can’t swear that Minnesota’s on the crease, but it’s close enough. The top third (roughly) borders the westernmost and largest of the Great Lakes–but maybe that’s a landmark only Americans bother learning about. We had to memorize the names when I was in grade school: Homes–Huron, Ontario, Michigan, Erie, Superior. How cold does it get in Cornwall anyway? I have a Spanish friend who moved to Hertfordshire from Madrid because she and her husband don’t like the heat. It takes all sorts. I spent a summer in Berlin and the heat was wonderful, although there were a couple of days when I really didn’t want to go outside. We are none of us satisfied with what we’re born to. Hihi. This ALMOST made me vote. Whoa, hang on. No one is discussing the dampness that goes to the bones that accompanies the cold in Britain. That could take the most seasoned MIdwesterner and make him or her go running for the tea and nearest fireplace. It’s apples to oranges, so I think both areas have equal reasons to gripe. I don’t want to be the person who stands in the way of anyone’s right to gripe. It’s too dangerous and it doesn’t work anyway. Fair enough? Equal opportunity whinging. It is the foolproof way to promote peace. We’ve got to find a way to put this into action. I mean, technically, it is the right to free speech, but the right to whinge really needed reinforcement as a separate amendment. I’m a New Englander, and so I have been cold. But like Barb in her castle, I was most cold when I lived in a house in Switzerland where each room had its own heater. The cost of electricity was so high that we only warmed the room we were in at any given moment, turning it down when leaving. Trouble was, it took a long time to warm each room, and then it was time to go somewhere else. I am shaking just remembering. I’m convinced: That would be cold. If the walls don’t warm up, the room doesn’t warm up. Your feet don’t warm up. The floors were all tile. Brrrrrrrrrrrrr. I can’t help wondering what life was like when people were living in–well, I don’t know what the early people in Switzerland built. In Britain, it would’ve been wattle and daub–which is to say, not much. Damn, that must’ve been cold. So winter would’ve been okay, but summer would’ve been a problem. I would give my left arm, well maybe not my arm but our scabby cats front leg for a hot beef sandwich. Ask for one over here and they look at you as if you are mad, especially if you ask for a little gravy on top. No, no, keep your cats intact. Please. I used to work in a cafe that served them, and the truth is that the potatoes and the gravy were both from a box. So: instant mashed potatoes, gravy mix, beef sandwich on white bread. Everyone’s happy–especially the cats. The “them” in the comment above was hot beef sandwiches, not cats. Just in case that wsn’t clear.